This lace is perfect for accenting all of your altered projects, hair accessories, scrap..
Webster's Pages All About Me Trim Pack (1 yd each of 6 designs) ..
Gorgeous lace! Perfect for accenting all of your altered projects, scrapbooking layouts and cards..
Webster's Pages Everyday Poetry Trim Pack (1 yd each of 6 designs) ..
Gorgeous pearl trim! Perfect for accenting all of your altered projects, scrapbooking ..
Webster's Pages Game On Trim Pack (1 yd each of 6 designs) ..
Gorgeous pearl trim! 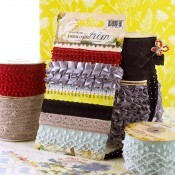 Perfect for accenting all of your altered projects, scrapbooking layouts and..
Gorgeous vintage lace! 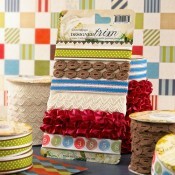 Perfect for accenting all of your altered projects, scrapbooking layouts a.. This lace is perfect for accenting all of your altered projects, hair accessories, ..